Please note that this is just what I did, any personal injury that happens from replicating this tutorial, is your own fault. I am assuming that you know how to properly use the listed tools; I am not an expert on those tools; so please refer to the owner’s manuals that you got with the tools for safety and other instructions. A small note on the strapping and clips, you can find them extremely cheap (50 clips for $15 and 100 yards of strapping for around $15 each on Amazon); yes there is the wait for shipping, but the savings in my opinion is worth it. I have found starting from the bottom up works best; so starting with your bottom gut plate (depending on upon your torso length, it is either the 3rd or 4th plate) mark where you want to drill the holes. I choose to have it on the outer edges, some do a third in the middle, and that is their choice, however I like the sides. The image above shows how I made a straight line and where I choose to mark where I wanted the the holes; it also shows how I measured how much strapping I would need, and the basic layout. Once you have marked your holes, go ahead and drill them. Do any needed clean up make the hole as clean as possible. Next take your strapping and use the lighter to prevent the edges from fraying (this will only work if you are using nylon), basically just run the fame across the ends. I use a candle to keep the flame going, and I can then use both hands to control the armor, and strap. 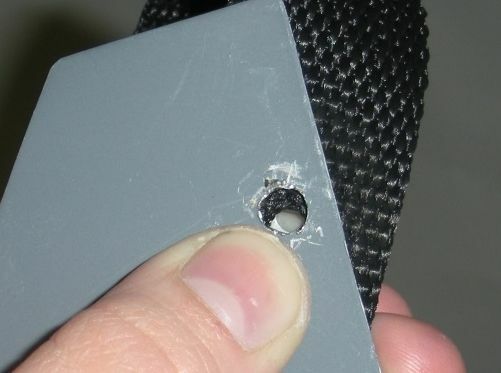 Using your hole punch, punch a quick hole near the end of your strapping. Not the very end, you want around ¼ to 3/8 of an inch space between the end and your hole. Do the same for both straps; then once again, using your lighter or candle, heat up those holes to prevent fraying. It should only take a few seconds, any more and it gets too hot and melts. Now that you have the holes ready to go, get a rivet, stick it in the hole of the plate, then the strap, and lastly the washer. You need the washer; if you don’t use it, the strap will fall off, and you will be forced to drill out the rivet, and redo what you just did. Repeat the above paragraph for the second hole. Now time to line up your plates, I used magnets, and eyeballed it. You can use a square to get it straight, I used the magnets to hold the plate in place while I marked where the hole on the strap was going to go. Once satisfied with the placement, go ahead and mark both sides; remove the unfastened plate. Using your hole punch, punch a hole right over the mark; using the candle, or lighter, heat the hole to stop the fraying; do this for both sides. I found that crimping the rivet once, then lining up the second one and riveting it, until it pops, then going back to the first helps. Repeat these steps for the rest of the gut plates. 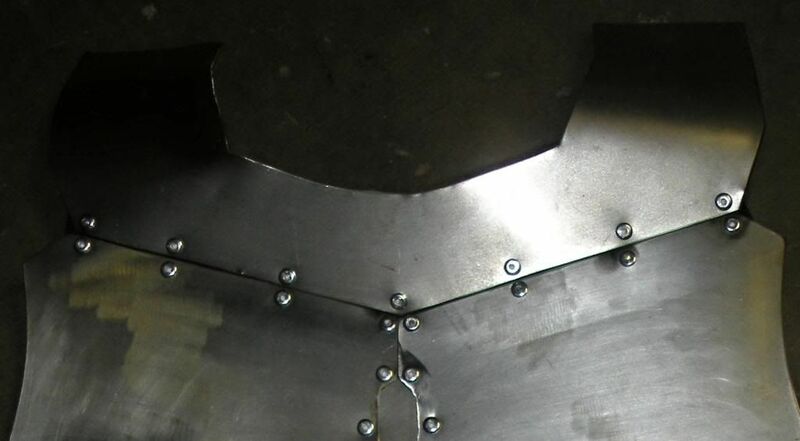 Once you have them done, get your chest plates, now depending on if you went with the actual diamond, or if you went with the plate that hides behind the chest plates and fills in the diamond will depend on how many holes you will need to drill. 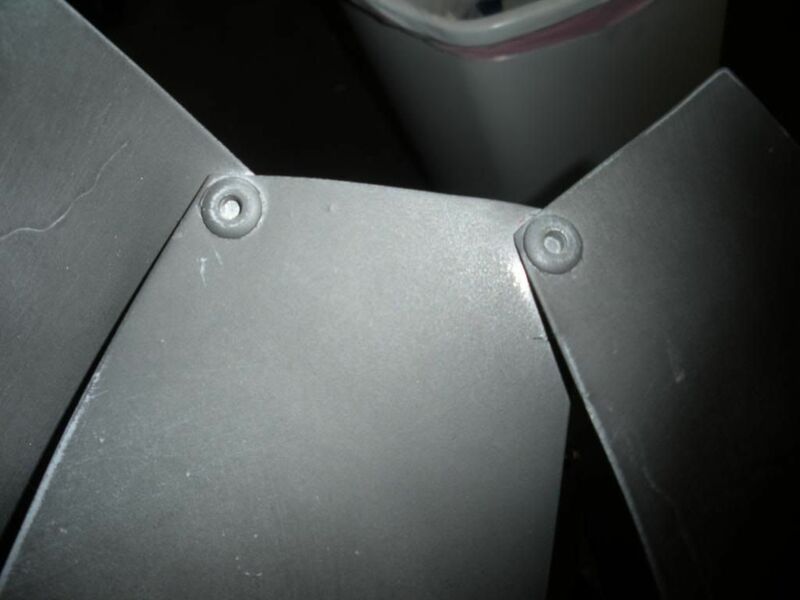 For those with the diamond you will need to drill 2 holes in each plate; for the plate, you will need to drill 4 holes. The image above shows the holes with the arrows pointed at them are the ones that you will need to drill for the diamond. While drilling mine and many of my commissions I have found it easiest to drill one hole, then take the plate that you are using for the diamond, and attach them. Then drill the other 5 holes, this ensures that A) the holes line up and B) it is easier to assemble. 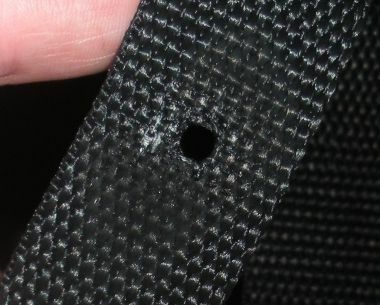 The holes in the bottom corners are about 1 ½ inches from the bottom. Before attaching the chest to the gut I suggest connecting the right and left together first. That way you have a solid piece when you line it up on the top gut plate. For the diamond plate, line it up, and mark the holes, I have found it is easiest when you do one side then the other, first, do the top and bottom, then once the plate is attached, drill the middle hole. This helps with it lining up, and having to drill more than once; which can be a pain. Now attach your chest to your gut plates. You have completed the chest; you can choose to either attach the collar to the chest, or to your vest. If you attach it to your chest, I suggest you use 4 points of contact; 2 on each chest plate, I would suggest using strapping, and not having any overlap. That way you can get the most of your collar and chest. 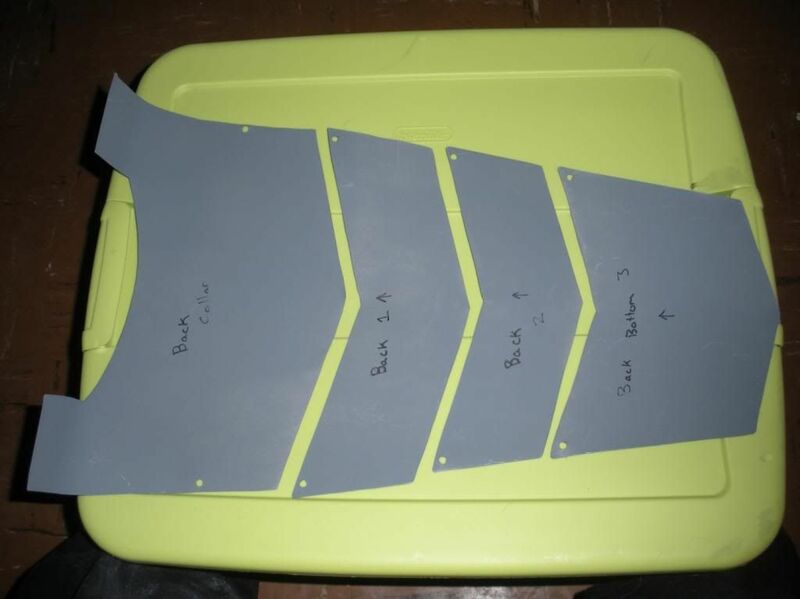 Just like the chest plates you are going to lay them out from top to bottom; using a ruler or a square line out where you want to drill your holes. Start with your bottom plate and work your way to the top, riveting the strap to the plate; just like the chest plates. Remember to use your washers! For the top plate I suggest going up about 3 inches so you will still be able to move and the plates will able to move with you. To attach the torso plates to the collar I used small strips of the strapping to make it flexible; with rivets and washers to secure it all together. There are a few ways to attach the two plates you can use a scrap piece and use it as a back, and rivet both plates to that. 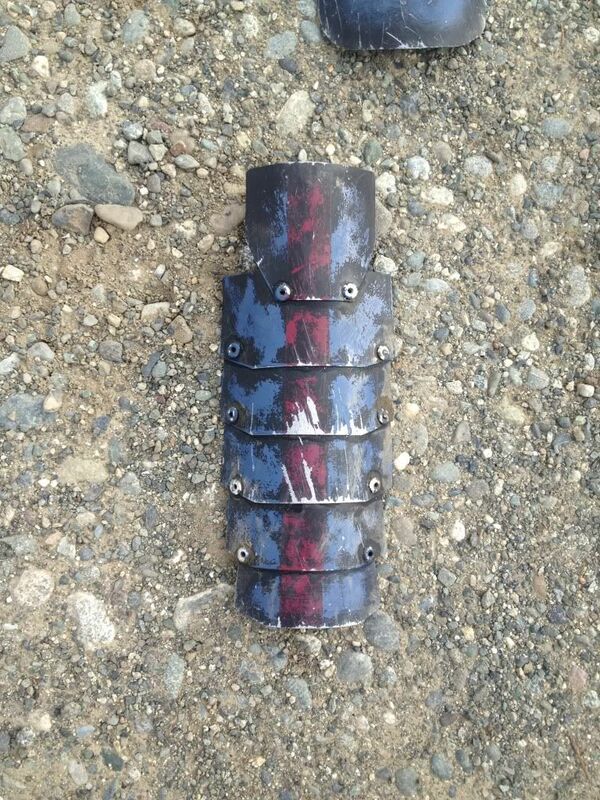 The blue represents the plates, the brownish color rivets. You can also use parachute clips and have the plates detachable. You can also just attach them to your vest, this is really a personal choice and preference. Yaser style shoulders attachment is odd; I have tried both the sides and the middle and I have found the middle to work the best. You will need to drill a hole in the middle of the plate; then using rivets, strapping and washers assemble them as I have explained how to use rivets and strapping through this tutorial. For the Drake style I used the sides of the plates to attach them. I also did not use any strapping; these to move, however they do restrict some movement in the shoulder area. You will need to drill 8 holes on each plate, (this is an example for one side of the plate) one on the bottom of the top plate, two holes on the middle plate both top and bottom, and lastly one hole on the top of the bottom plate. For assembly, you will need to lay out the plates, from top to bottom; all the plates are labeled, and will have a center line. There is about a 1/4 inch play at the top of each plate, but depending on how tall your shins are, there may be more play room. Starting from the TOP this time, drill your first holes, line the center line of the top (either shin or knee plate) and 2nd plate, mark where the holes should be. Take the 2nd plate; drill those holes, and the next set of holes at the bottom. As a personal preference, I go ahead and rivet these plates together, making sure that the holes line up as I finish each plate. Continue on down through the rest of the plates, doing the same thing on down. 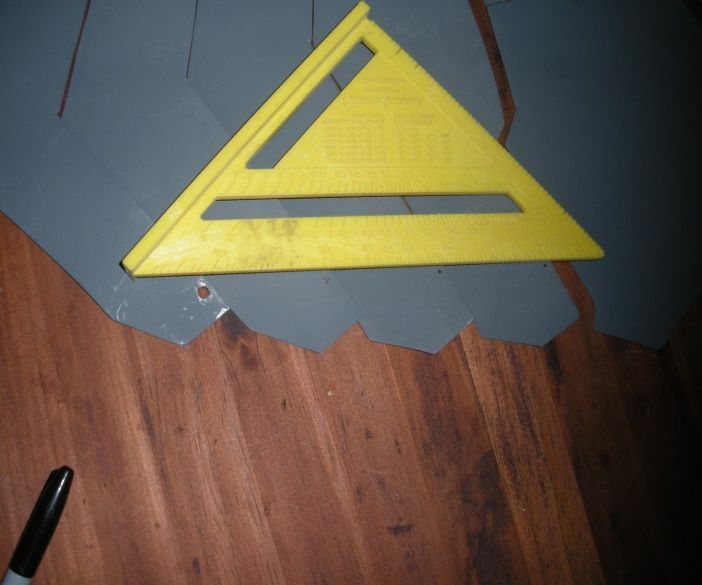 The shins will turn out better if you form the plates first then assemble. This is how I assemble the legacy armor, both Drake and the standard styles, let me know if you have any questions or want more pics, I will do my best to get better pics for those that ask. I am using the normal style legacy plates, but I appreciate seeing a tutorial on how to assemble the armor. 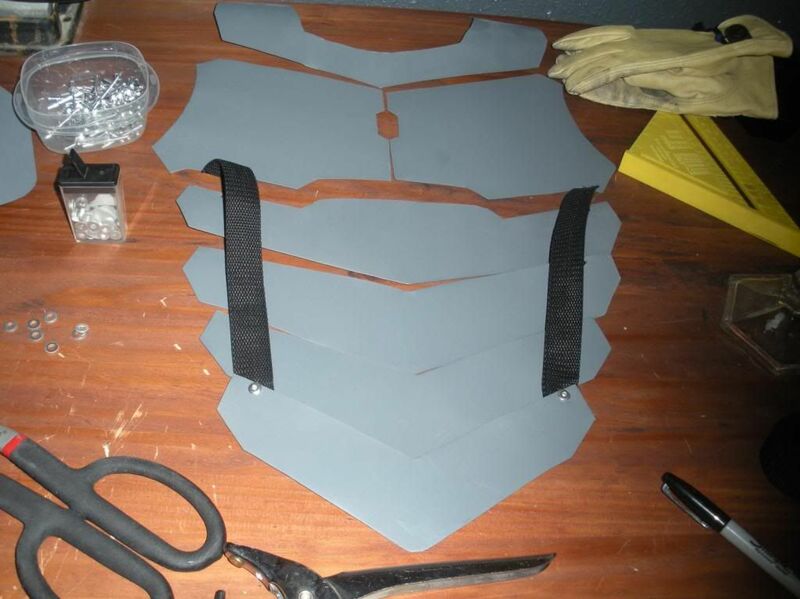 Sizing, tracing, and cutting the armor is easy, but assembly seems challenging so thanks for this. Do you assemble the chest armor plates before shaping them? Or do you shape and then assemble? Or do you mark holes and drill them when the plates are flat, then shape them, and then actually assemble? This part seems the most scary to me. Thanks in advance for any further clarification! I did a partial shaping before I assembled, once it was assembled, I then fully shaped it. As for the hole drilling, I partially shape, then drill, assemble; I've noticed that if you have them flat the hole will not match as well as they should if they were partially shaped. My suggestion would be to wear gloves to protect your hands (I've cut myself a number of times) and take it one piece at a time. Great! That all makes sense. Thank you very much!